Home » Featured » Scholastic Storybook Treasure DVD Giveaway! Scholastic Storybook Treasure DVD Giveaway! I am a big believer in getting kids EXCITED about books. Anything that puts more books into the hands of children is not only valuable, but an incredible tool. While some kids are born with a natural love of reading, others need a bit of a nudge. Whether your child is an all-out bookworm, or more of a reluctant reader, Scholastic’s Storybook Treasure DVD sets will engage and entertain your child, while raising their overall interest in literacy! The #1 award-winning DVD series is available for purchase and features a wide variety of titles. From old favorites like Where the Wild Things Are and Harold and the Purple Crayon, to new titles like The Curious Garden and Robot Zot!, there is a DVD collection that is just right for your child! Each DVD features a handful of beloved children’s books-turned illustrated read-alouds. (Think Reading Rainbow without Levar Burton.) The stories come alive, and your child sits wide-eyed, soaking in the story. These videos build fluency, as your child hears the way a book should be read, with appropriate phrasing, pauses, and expression. Children who are already reading, or are beginning readers can read along, following the words on the screen. Learning new words, sounding out as they listen, your child is soaking in SO much information about reading. As a former teacher, I cannot express how important it is to instill a love of reading at an early age. I believe that Scholastic’s Storybook Treasure DVD sets can help. My family was blessed to review three of Scholastic’s newest releases. This 3 DVD set featured 13 animal stories including Whistle for Willie, Bark, George and Scaredy Squirrel. I have a house full of animal lovers, so they were delighted to see so many stories featuring their favorite creatures and critters. My kids are HUGE Magic School Bus fans, and were SO excited to receive this set. This 3 DVD set featured 12 episodes of the beloved series. We went on dinosaur adventures, flew with the butterflies, and learned all about circulation (and so much more!) I love the way the Magic School Bus promotes both literacy AND science in such an engaging and non-threatening way. You will have little scientists on your hands in no time! My First Collection Vol.4 featuring Robot Zot! 3 lucky Chasing Supermom readers will be watching and learning along with Scholastic Storybook Treasure DVDs. You have the chance to win one of these awesome sets! Sorry, this contest is limited to US readers only. Good luck and happy watching! *I received free product in exchange for this review and giveaway. All opinions are my own. we want to win the magic school bus!! Robot Zot looks really cute too! Robot Zot is my son’s favorite book but we love Magic School Bus books too! I know they would love any of these DVDs! Also, like the Chicka Chicka Boom Boom one. We love that book too and know the DVD would be great! I want to win the magic school bus! I would like to own stone soup! Magic School Bus-such a cute and educational show! The Night Before Christmas would be the one I’d like that’s not in the giveaway. The Magic School Bus set would be awesome! I Like the Magic School bus human body! Robot zot or chicken little! 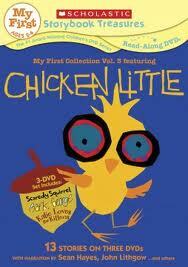 Chicken Little is my fav!! 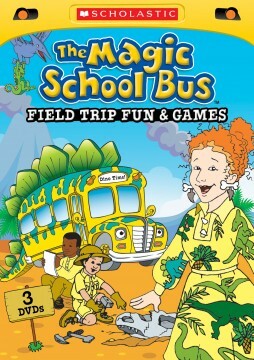 I would like The Magic School Bus Field Trip Fun and Games most, but I would be happy with any of them. Thanks! I would also love to have My First Scholastic Storybook Treasures DVD Collection! My First Collection Vol.4 featuring Robot Zot. I’d love to win the Magic School bus set. Thanks! Pigeon & Pals would also be fun – I didn’t realize the Mo Willems books had been animated.